I have a bumper crop of passion fruit this summer and have been working hard to find tasty ways to use this incredible fruit. There may be no better purpose for a passion fruit than a cocktail. 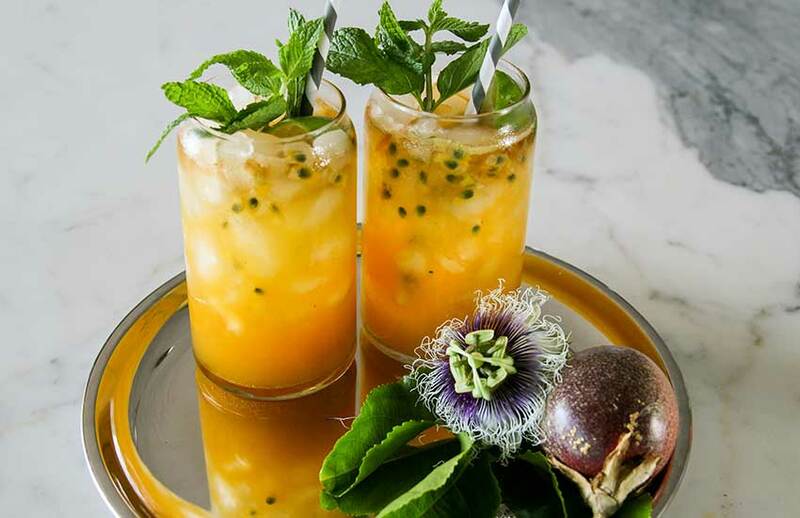 This passion fruit mojito is fragrant and delicious and is best served on a remote island, with waterfalls, flamingos preening on the shore, dolphins frolicking in the shoreline and handsome island people playing ukuleles on the beach. If that is not possible, the drink stands on its own as a little mini-vacay. Why Tequila in a Mojito? A traditionalist would say, it is not a mojito if it is made with tequila. OK, but you need to taste this before you decide. I love a good rum mojito, but often times they are too sweet. 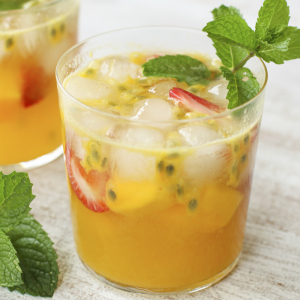 The tequila in this mojito works beautifully with the passion fruit, lime and mint. Still not convinced? Go ahead and make it with white rum instead and it will be great. For me, I am 100% sold on the tequila version. Traditional mojitos do not have a Myers's rum float, but that is not to say they shouldn't. Myers's rum is a smooth and delicious blend of 9 different rums. You can take a so-so cocktail and pour on a float of Myers's and you suddenly have something special. Myers's pairs particularly well with tropical fruit drinks, and this Passion Fruit Tequila Mojito is no different. Note: SNFD is an Amazon Affiliate and if you purchase items through the links we may make a small commision on the sale. Fresh passion fruit or passion fruit puree -- If you don't have a fresh passion fruit vine in your backyard, don't worry. 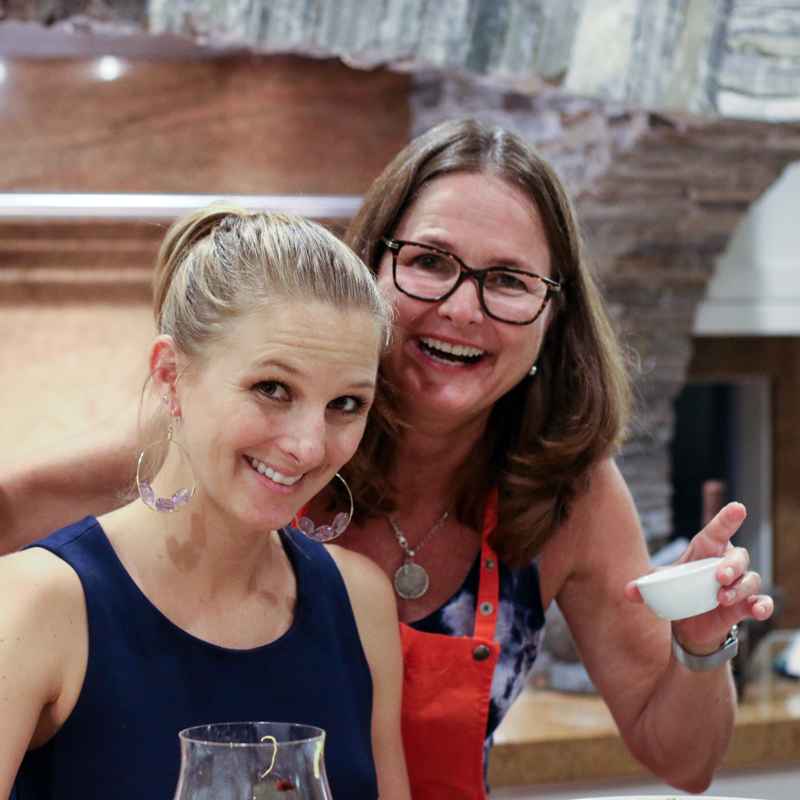 Funkinpro makes an awesome passion fruit puree. Turbinado sugar - A mojito should not be too sweet, but some sugar is needed. I personally like a little sugar crunch in a mojito and this large crystal sugar does the trick. Some people hate the sugar crunch. If that is you, use regular sugar or try brown sugar. Two highball glasses. The tall skinny cocktail glasses not the short stout ones. 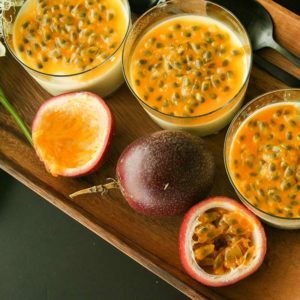 Seeds and juice from 2 medium-sized passion fruits or 4 ounces passion fruit puree. Put the remaining mint leaves, with stems removed, and sugar in a cocktail shaker. Muddle leaves until they begin to break up. Add lime quarters and muddle again until the limes have released their juice. Fill two highball glasses with crushed ice. Add fresh passion fruit juice and seeds (if your are using fresh fruit) or passion fruit puree and white tequila to the cocktail shaker. Add a handful of ice and shake until condensation forms on the outside of the cocktail shaker. Strain into ice-filled glasses. Some pieces of mint will make their way into the glass. This is a good thing. Too much of the mint, however, and you will be picking it out of your teeth. Top each glass with a splash of mineral water and a float of Myers's rum. Garnish with a squeeze of lime and a sprig of mint.